Work avoidance seems to be an ongoing issue across different settings and grade levels. In a previous blog, we discussed the use of a checklist with a strategic “sandwiching” of a less preferred activity in between two highly preferred activities. This strategy is often very effective in building success on academic activities that the student would prefer to avoid. However, not one thing works for every student, as you have probably discovered for yourself. So this week, we will explore a similar strategy that is in a different format: a BINGO card! This strategy was created in a staff meeting with a general education teacher and campus administrators trying to help a student complete work well within his grasp. By analyzing the data and student strengths, it was determined that he was capable of completing the work. In spite of the cognitive strengths, the student would cover his head up and not complete the academic tasks. So, with no work completed, the team was ready to try almost anything to get something. The student liked dinosaurs and everything having to do with them. 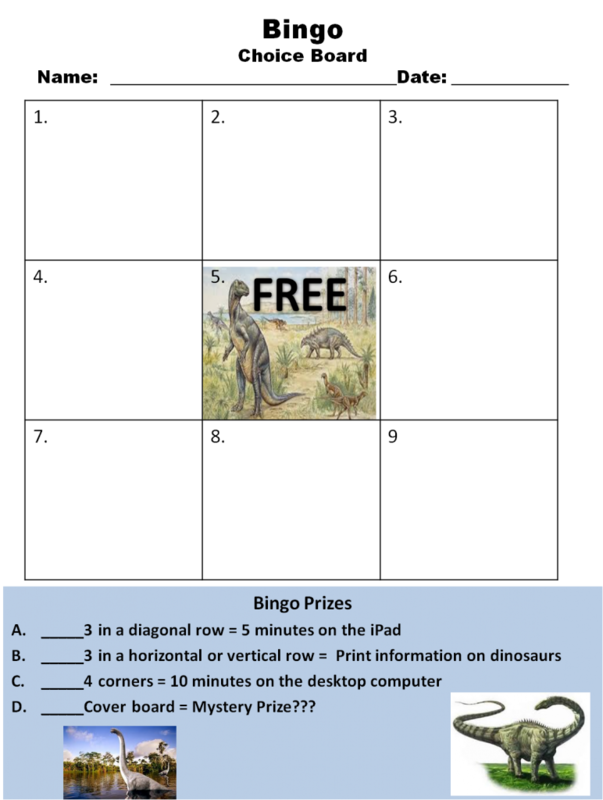 The student also liked games and so the team decided to create a 3 X 3 BINGO card decorated with dinosaurs as a starting point. Then, the specific activities selected to go in each grid were selected based on student interest. One activity was simply to read a book about dinosaurs with another going to a website and printing out a dinosaur picture. Both of these activities have a high likelihood of motivating the student to complete them as they build on a strong interest. Another layer of choice and reinforcement built into the BINGO card is in the prize options. The prizes are listed from least to most amount of academic work completed. _____Cover board = Mystery Prize??? The student can choose which activities he completes based on his preference of activities or based on which prize he wants to have. Once the student experiences success in completing work, the types of activities may be incrementally more challenging and diverse. Let us know if you have another idea of how to use a game, choices, and reinforcement to motivate a student toward work completion and success. I like the bingo idea as well. 11 July was busy for discussions and summer sessions. There was the Spectrum Affinities and Science discussion. Hope the webinar/seminar went well for everyone.